The smart key market is set to generate revenues of €7.5 billion in Europe by 2018 with fitment rates reaching 50% according to SBD's latest Smart Key Forecast. With the industry changing more towards Multi-Point Locking and UPVC fittings, Aldridge have taken this as an opportunity to produce a new Catalogue dedicated to the growing market, which showcases the huge product range they offer. 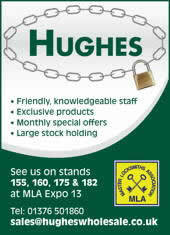 * Two brilliant new additions to the range of famous Miracle automatic key cutting machines. 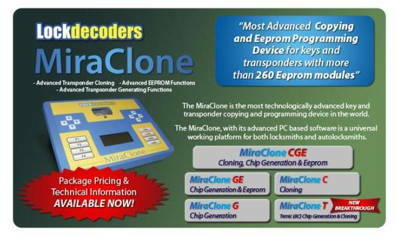 * The MiraClone advanced eeprom device with new cloning facilities. New methods of cloning motorbike and scooter transponders. * A startling new application of the firm's Magic F30 engraving machine for the shop locksmith - automatic engraving of master key number sequences or personalising key-blanks with your firm's name. * An amazing new locksmith tool which is totally revolutionary! The firm will also have details of its new Extended Warranty Service which is unique and also of its no interest extended payment plan. The MAX6MUM SECURITY App was first previewed at the FIT Show in April and received a positive reception from visitors. It enables the user to create their own MAX6MUM SECURITY door which will protect against burglars, vandals and bogus callers. Locks that are used in millions of homes and residential buildings worldwide and designed specifically to thwart hacking are easily opened with both a screwdriver and wire, two researchers say. Kwikset smartkey locks are certified Grade 1 security for residential use by the Builders Hardware Manufacturers Association and are advertised by Kwikset as being invulnerable to being hacked with wires, screwdrivers, or anything else inserted in the keyway. At the recent Def Con hacker conference MIT students David Lawrence and Eric Van Albert released a piece of code that will allow anyone to create a 3D-printable software model of any Schlage Primus key, despite Schlage's attempts to prevent the duplication. With just a flatbed scanner and their software tool, they were able to produce precise models of Primus keys that they uploaded to the 3D-printing services Shapeways and i.Materialise, who mailed them working copies of the keys in materials ranging from nylon to titanium. IFSEC Istanbul is the all-new security, fire and safety event to reach the Southeastern Europe market, taking place from the 30th September - 2nd October, 2013. Istanbul, at the hub of South East Europe, offers an unrivalled route to the Middle East and new Turkic republics in Central Asia. With one of the highest output growth rates in Europe, the challenges poised by Turkey's growth necessitates improving the overall planning system and local public management, making this the perfect time to enter this market. A Hollywood man was arrested after attempting to gain access to a home that wasn't his own, with the help of an unsuspecting locksmith, local police said. Bruce Davis' story didn't seem peculiar: He had lost the keys to his home and needed a locksmith to get inside. This is what he told an employee at Lee's Locksmith and Bicycle Shop to get him to open the door to a Hollywood home, the arrest report stated. Locksmiths have the ability to perhaps make their way into pretty much anything: houses, cars, offices. What if one decided to go on a killing spree? That's the premise of director Ryan Miningham's independent horror thriller "The Locksmith." Filming takes place over August and September in the small town of Dalton, Georgia, USA. But don't let it give anyone ideas! Lock and Tech USA, Atlanta's dedicated locksmith and security services company announces the expansion of their authorised key service stations in the Atlanta area. The company's authorised key service stations offer reliable and affordable key cutting services throughout Atlanta. These stations are equipped with the latest locksmith tools and hardware available and are designed to assist customers who are looking to duplicate existing keys or cut new keys from scratch. Chris, from County Durham, has more than 20 years' experience in sales management and business development, and has joined Hadrian Technology to increase the firm's exposure in regional, national and international markets. According to Access Control, a new Market Update from market intelligence provider Key Note, the UK access control market fell by 1.3% in 2012, after the market contracted by 1.6% in the previous year. 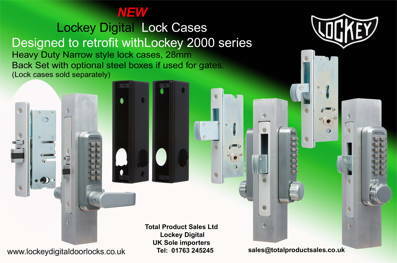 Lockdecoders announce that qualified customers can now have extended credit for major purchases of £1500 and over. Following the riots in London of August 2011, the Metropolitan Police will be holding a conference on Wednesday 18th September 2013 at New Scotland Yard for all representatives of the CCTV sector to discuss lessons learnt, good and bad practice and how to improve the overall effectiveness of CCTV.